An armored vehicle idled outside the Bruxelles-Midi railway station Tuesday morning, manned by two armed soldiers — the kind of vehicle you'd expect to find on a battlefield, not in the genteel streets of the Belgian capital. Next to the imposing Dingo 2 armored personnel carrier — which today is missing its signature machine gun — is a car with a broken taillight. Not enough to warrant a military intervention, you might think, but even the slightest of traffic accidents now means the army is dispatched. An attempt to take pictures of the unusual scene results in a heavy-handed check of our press credentials. On Tuesday, Brussels entered its fourth consecutive day of a level 4 terror alert, indicating a "serious and imminent" threat of an attack. The capital ground to a halt Saturday, and has remained at a standstill ever since. Those who wish to work remotely can do so. For the others, the only way to get around the city is by car, or on one of the very few buses that are still running. Stores have rolled down their metal shutters. Preschools, schools, and universities have closed their doors, as have many of the city's theaters, cinemas, and concert halls. The railway stations remain open, under the watchful eye of armed security forces. Three months after passengers thwarted a terror attack on board a Thalys high-speed train connecting Amsterdam to Paris via Brussels, controls at the station remain minimal, with only a simple ticket check on the platform. The French government announced on Tuesday that security gates will be installed at Paris and Lille train stations by the end of the year. Controls are stricter in the other direction, with officers searching our bags in Brussels before we boarded a train back to Paris. Eleven days after the massacre of 130 people in Paris by radical Islamists who plotted the carnage from Belgium, authorities suspect there's a terrorist cell ready to hit Brussels. "The deaths were in Paris but the lockdown is here," said Marco, a 40-something resident of the city who would only give his first name. Sitting in a café near the city's business center, Marco described the massive police and military presence as "a show" for the benefit of the government. "It's probably a deterrent, but it doesn't make us feel any safer," he said, a passing group of soldiers visible through the café window. The tightened security is mainly intended to help the police pursue their investigations into the Paris terror attacks, since many of the attackers and their potential accomplices seem to have spent some time in Belgium. On Sunday, Belgian police made 16 arrests, one of which resulted in a conviction on Monday. On Tuesday, a Belgian court convicted another individual of taking part in the activities of a terror group and in terrorist assassinations. 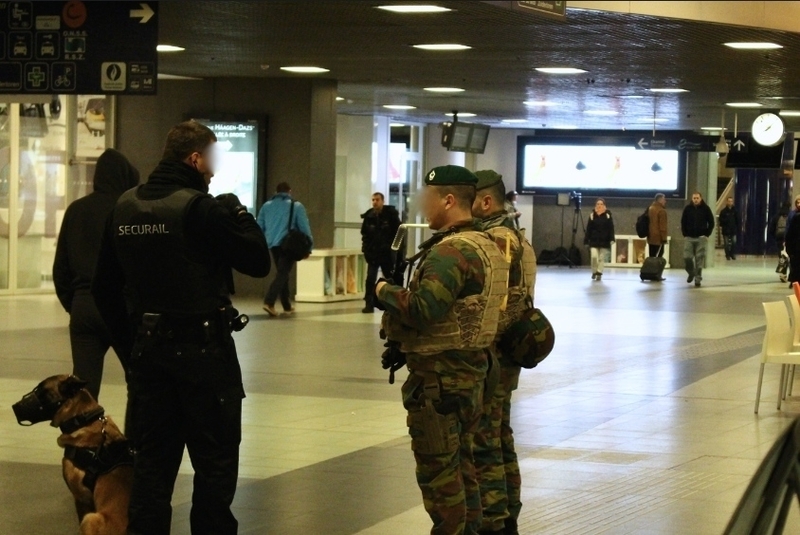 On Sunday, Belgian police requested that the public remain silent on social media about the ongoing police operations, for fear of alerting any potential targets to any imminent raids. Instead, Belgians flooded Twitter with pictures and GIFs of kittens. The ongoing lockdown is the opportunity for the government to show the public "it is taking the issue seriously," according to Marco, who said authorities have been too lenient in their efforts to stem radicalization "over the past 20 years" — a criticism that has also been voiced in France. But so far, the four-day lockdown has failed to deliver Europe's most wanted man Salah Abdeslam, a former resident of Brussels who is suspected of taking part in the Paris attacks. Abdelhamid Abaaoud, a Belgian of Moroccan origin who is suspected of masterminding the wave of deadly attacks, was killed last Wednesday when French police raided a building in Saint-Denis. On Tuesday, French public prosecutor François Molins said that Abaaoud may have been planning a second spate of attacks in the La Défense neighborhood of Paris, just a few days after he and his accomplices killed 130 people. Eager to help authorities get their hands on Abdeslam, King Philippe of Belgium has reached out to King Mohammed VI of Morocco for help with the investigation. According to reports, Moroccan intelligence services may have helped lead the French police to Abaaoud's hideout in Saint-Denis last week. While bringing the city to a standstill may be helping the police make progress in their ongoing investigations, the lockdown has already caused an estimated 1 billion euros ($1.06 billion) in losses. Those who rely on tourism to make a living have felt the biggest pinch. On the Grand-Place central square, tourists have been replaced by a handful of journalists who are reporting from under the arches of City Hall. An icy drizzle falls on the city, which looks a lot like a ghost town tonight. "Usually, the rain and the cold make people want to go out and buy chocolate — they find it comforting. But today, it's dead," said a sales assistant at Neuhaus, a famous Belgian chocolatier that has a store on the Grand-Place. A journalist claiming to be "with French television" walks into the store to ask whether sales have been affected — probably the closest thing the woman has had to a customer all day. Close to the Grand Place, not too far from a police station crawling with officers and soldiers, is the famous Manneken Pis — a small bronze sculpture of a boy urinating into a fountain. Usually, you have to jostle with tourists just to get a picture. But today, no one is bothering the two Spanish tourists who take a selfie with the statue in the background. Most of the city's tourists seem to be hanging out at McDonald's, on Rue Neuve. Couples and families speaking Japanese, Spanish, and German ponder what to do next on their trip — a tricky question since all the city's museums are closed. The biggest excitement right now seems to be the spotting of a heavily armed soldier in the fast-food restaurant's bathroom. The city's residential neighborhoods are eerily silent and the streets are more or less deserted. The only ones who are out in the streets are the city's waste disposal crews, gardeners and road workers. It seems there are more people wearing yellow fluorescent vests and army fatigues than plainclothes civilians. "The student bars we usually go to have been shut down by order of the police," explained William, a French chemistry student who lives in Ixelles and also would only give his first name. "Paradoxically, I think my family in France is more worried than I am. I only ventured out once in the last few days to go to the supermarket, which was closed," he said. Preschools, schools and universities are scheduled to re-open Wednesday, as will the subway. But the heavy police presence will be maintained even after the lockdown is lifted. Authorities have announced that 300 police officers would be deployed outside schools and a further 200 would be stationed inside the subway. The Belgian education minister has also suggested building safe rooms in schools to protect students in case of an attack. By the end of the afternoon, some of city's cafés had started filling up, as Brussels prepared to come out of its four-day coma. "People are going to have to take in this threat and learn to live with it," said Marco. "Otherwise, they will have won, and that's what they want."